You must be a member of the Bern Hiking Group to attend this activity. Would you like to join this group? 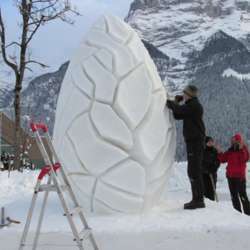 Let us celebrate the New Year with the World Snow Festival in Grindelwald. We will view the sculptures and photograph the various teams upon our arrival in Grindelwald. The Sculptures are displayed in Barenplatz close to the train station. We will then walk either through the village and or up on the mountain depending on the weather. We will give further details closer to the time. I suggest, you bring high top walking boots and snow grips to go over the soles of your shoes. Bring poles if you own them,two pairs of gloves,hat, wear water proof or ski clothing. We will be walking on snowy sidewalks or groomed mountain trails. Depending on cloud levels. Medium to easy walking but no doubt plenty of up and down. At the end of the walk we will enjoy a pizza or something light then at Protected content the Sculptures with the coloured lights. The end. Hope to see you all. Until then we are expecting very cold and snowy conditions so the make the most of any clear fine days.